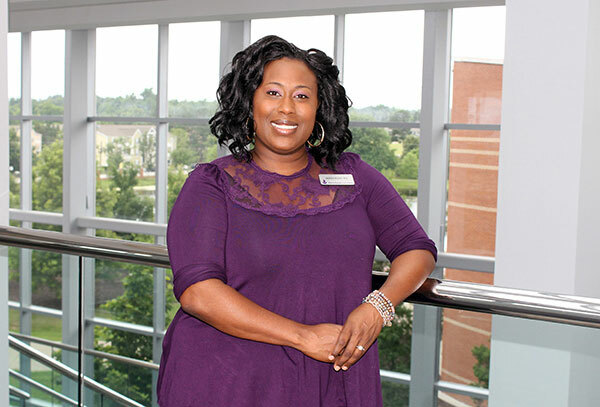 Jasmine Brown, director of Clinical Education for MGA's Department of Respiratory Therapy, develops Experiential Learning projects for RT students, and serves on the Faculty Senate. Full Title: Director of Clinical Education & Assistant Professor for the Department of Respiratory Therapy; registered respiratory therapist; adult critical care specialist; chronic obstructive pulmonary disease educator. Degrees: Master of Science in Cardiopulmonary Science from Georgia State University, graduate of the University of Arkansas for Medical Sciences and the former Macon State College respiratory therapy program. "I am currently the Experiential Learning (EL) liaison for the Department of Respiratory Therapy. I have developed two EL activities for RT students: 1) Neonatal track- This activity allows selected students to participate in skill training in resuscitation and storking neonates. Participants receive 30 weeks of additional training geared toward local hospital expectations. 2) Preceptorship- This activity allows upper-level RT students to precept RT underclassmen in equipment and ventilator labs. Participants are required to volunteer 6 hours of their time and complete a preceptor course offered by the American Association of Respiratory Care. Collaborated with Betsy McDaniel, chair of the Occupational Therapy Assistant department, to develop a course redesign for an interdisciplinary EL project. RT students and OTA students worked on a case study together identifying the needs of each discipline. As a result students worked together for the best patient outcome while earning an appreciation for one another's scope of practice. Collaborated with the Career Services department to develop mock interviews for RT students to prepare them for the workforce. Students participated in resume review, professional dress and feedback sessions from potential employers. Collaborated with Nursing department for an interdisciplinary project called TEAMSTEPPs. It is a program developed by Department of Defense's Patient Safety Program in collaboration with the Agency for Healthcare Research and Quality. RT and BSN students worked together in simulation labs to promote patient safety by improving communication skills. Developed and implemented a simulation program for RT Students. RT students participate in clinical simulation based on National Board of Respiratory Care standards and are evaluated to improve student performance in clinical. A high fidelity mannequin is used to enhance the learning experience." "Also, I currently serve on the Faculty Senate and the Executive Committee at MGA." "I am an alumna of this institution and I was taught by the faculty members that I currently serve alongside. When I was a student, they were engaged and caring. I always felt they wrapped their arms around the students and do all they can to see them succeed. I was too excited to be part of this team!!" "The School of Health Sciences dean, Dr. Tara Underwood, is engaged in our efforts and very supportive. And she tries hard to acknowledge the accomplishments and efforts of the faculty and staff." "Tenacity! Sometimes I feel that the respiratory therapy profession is one of many unrecognized disciplines in hospital settings. RT students need tenacity to thrive in a culture where physicians and nurses 'appear' to be the only care givers according to patient surveys. Although RTs want to go where everybody knows our name, patients and clinicians alike are always glad we came!" "I love to color. It helps me clear my mind and relax."